The first modern settlement in Montclair, New Jersey, materialized in the mid-17th century when settlers from England created their homesteads here. Dutch settlers arrived soon after and created another settlement in the area and named it Speertown. Gradually, the settlement grew and then took on the name Cranetown. Eventually, the town of Montclair was established and officially recognized in 1860. By this time, Montclair was connected to New York by train and ferry, and was a famous holiday destination for the people residing in surrounding cities. The 20th century brought with it migrants from different countries, adding to the diversity of the population. As commerce grew, grand mansions came up, and as working class people from outside settled here, modest homesteads were also built. Today, this remarkable community is home to almost 40,000 residents. This splendid community, with its rich history and heritage, is home to numerous points of historical interest. The scale of commercial development broadened after the WW II, giving rise to the need to preserve the heritage buildings in the area, while also making room for commercial activities. This has lead to Montclair developing a distinctive old-world ambiance, perfect for families and people looking for a relaxed pace of life. In addition to these wonderful features, the city also offers opportunities for commercial enterprises as the Montclair Business Association provides promotional and networking opportunities for businesses of all sizes. Montclair also has a rich cultural landscape, shaped by premier cultural institutions such as the Montclair Art Museum, known for its Native American and modern American art exhibits. Furthermore, Montclair offers a multitude of recreation opportunities at its many public parks and sports facilities. And if all of that isn’t enough to impress prospective homebuyers, the city also has great public transportation options. Homes for sale in Montclair come in a variety of sizes and architectural styles, in a broad price range that accommodates most budgets. 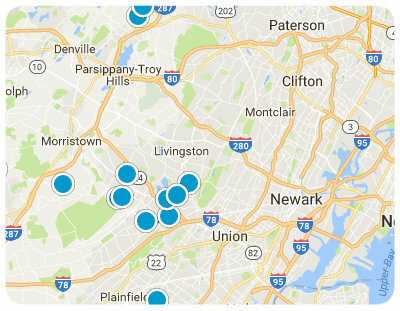 If you would like to learn about the available real estate in Montclair, New Jersey, please allow us to assist you and contact us today.